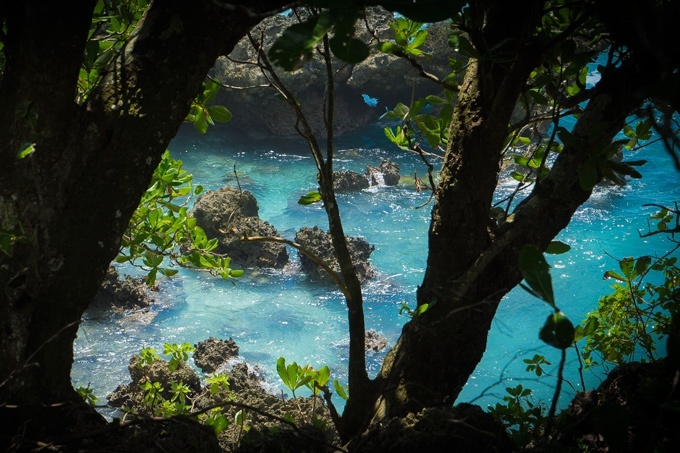 Ague Cove is a hidden gem in Guam’s suburban village of Dededo. Find the old FAA housing area, park, and walk a quarter of a mile to the trailhead. 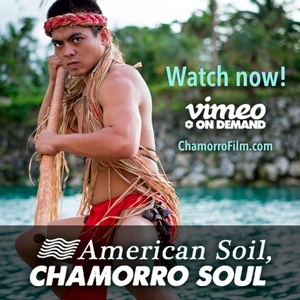 As with any hike on Guam, it is best to get permission before hiking on private land and respect no trespassing signs. 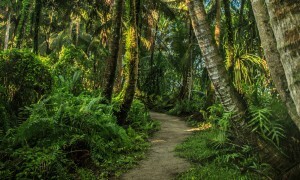 According to NOAA Science and Operations Officer Roger Edson, Jesus Pangelinan is the contact for those who wish to hike on this private land. Mr. Pangelinan can be reached at (671) 477-9269. Stop just before the trailhead to admire the untouched beauty of this scenic spot. 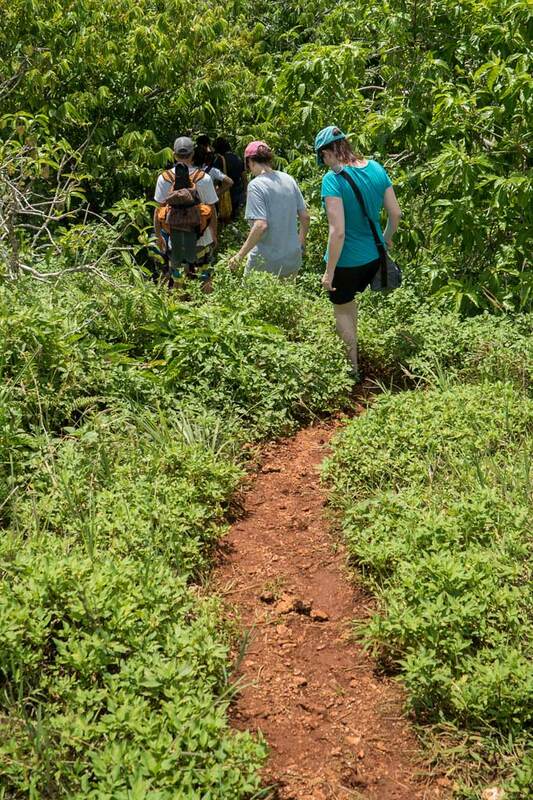 The trail is a moderate hike down in dry weather, but can be slippery during and after rain. Descend a winding trail through the jungle some 200 feet and you will be rewarded with this view. 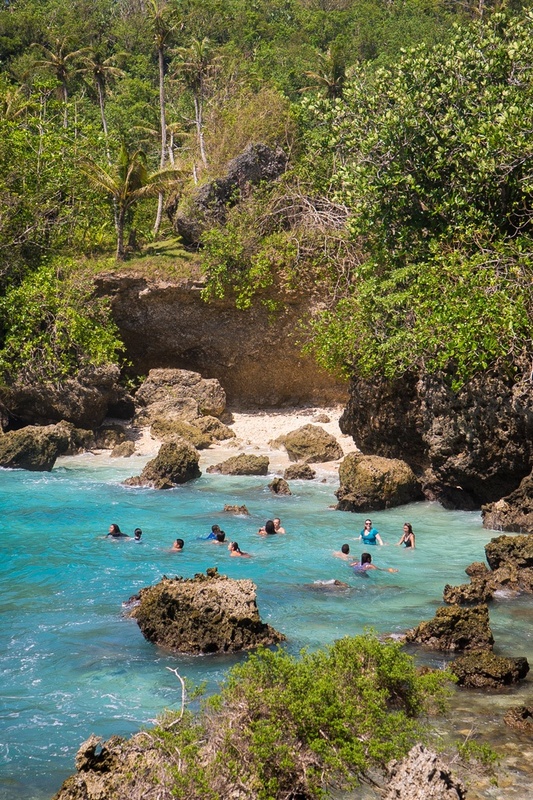 Buyer beware, Ague Cove is not for the faint of heart. I haven’t told you about the hike back up yet. However, the real danger isn’t the threat of cardiac arrest on the steep climb up the cliff, it’s the pounding waves and nebulous undertow. 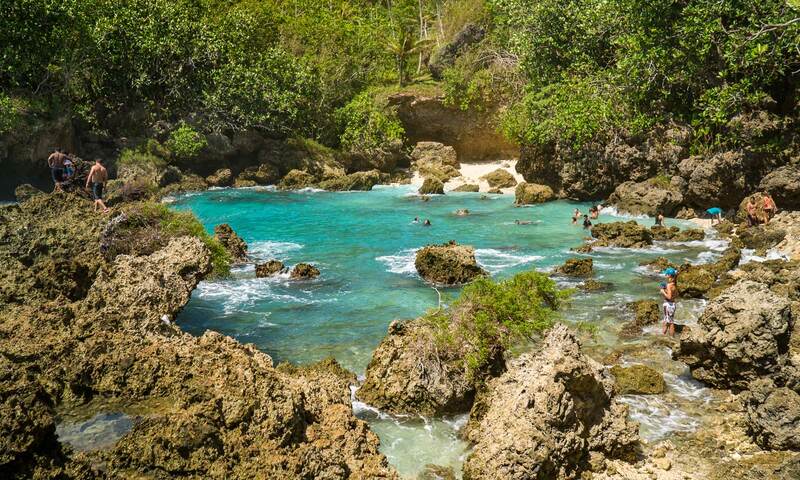 Combine that with razor sharp coral, and Ague Cove can be dangerous. Just hours before my hike to the cove, two swimmers were picked up by emergency services. Only one survived. Of course, I didn’t know about this during my hike, but it’s a sobering reminder to always take safety precautions in Guam waters. 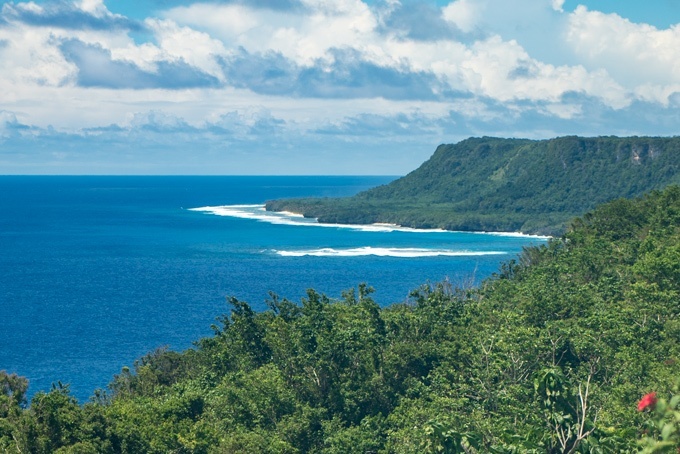 Read our Safety Tips for Hiking on Guam. 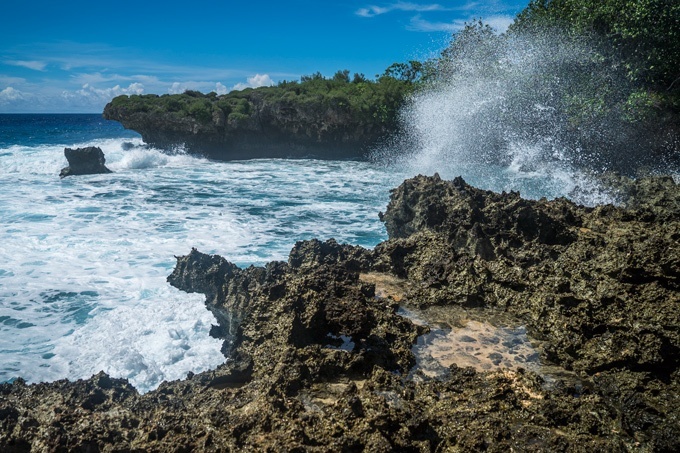 Adventurous types will climb the coral outcrops for stunning views of the insistent waves and coastline and will even jump off. Again, a safety caution — watch where you land and don’t try this if you aren’t a strong swimmer. It was challenging to stay in the cove during high tide and resist being pulled out by the undercurrent. 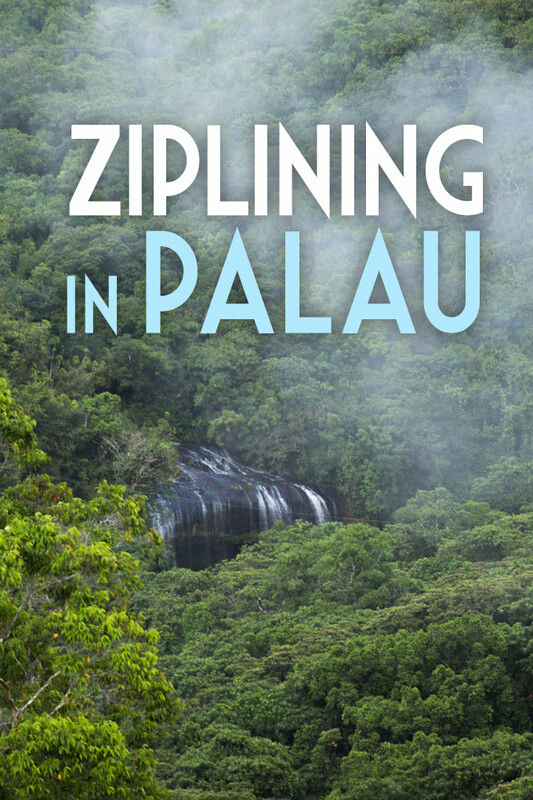 In conclusion, wear swim shoes, pack plenty of water and snacks, and make a half a day out of this excursion. 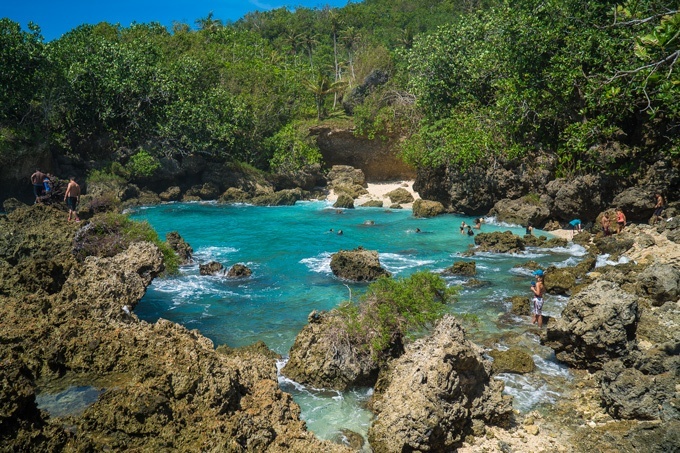 There’s shade along the perimeter of the cove for families to relax and simply admire yet another of Guam’s natural beauty spots. 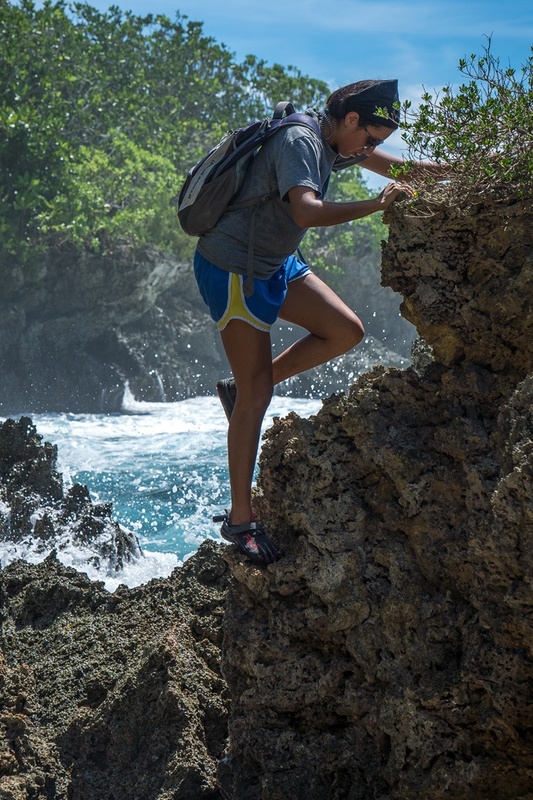 Read more about Guam’s Family Friendly Hikes. 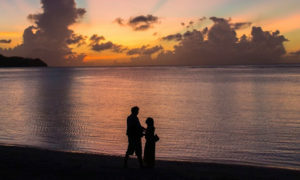 Copyright © 2019 The Guam Guide. All rights reserved.